WaterShed, the international-prize-winning solar house built by University of Maryland students, faculty and professional partners, has found a buyer and a permanent site – electric service provider Pepco is purchasing the high-tech building, and plans to locate it at one of its facilities in Montgomery County, Maryland. The purchase secures WaterShed’s future and will make its innovative technology and design available to the public for educational purposes, Pepco officials explain. Under the arrangement, Pepco and the University will partner on its operation, monitor its performance, conduct ongoing research and work closely on designing educational materials for the house. The house will serve as a “living classroom” to demonstrate smart, clean energy options, blending its original technological and design innovations with Pepco’s own advanced technology, such as its smart thermostats and home-based electric vehicle charging stations. After its win at the U.S. Department of Energy's Solar Decathlon last October, Watershed was disassembled and moved from the National Mall to College Park, awaiting a final home and buyer. Ultimately, PEPCO’s proposal was selected because the company shared the team’s vision of using the house to educate the public about sustainable, affordable and beautiful design, University officials explain. WaterShed overcame fierce competition against 19 other collegiate teams from around the world, each challenged to design, build, and operate solar-powered houses that are cost-effective, energy-efficient, and attractive. Like all of the Decathlon entries, WaterShed runs solely on solar power, but is also constructed to harvest, recycle and reuse water. Unique design elements, such as “manufactured wetlands” that both protect and produce resources, set WaterShed apart in the competition. Pepco plans to open WaterShed to the public at one of its Montgomery County facilities, though a final site selection has not yet been made. The plan is to use it for conferences, educational presentations and occasional public tours. It will also serve Pepco as an energy testing facility. University researchers will continue to monitor performance of its various systems to see measure its long-term operation. Pepco and the University of Maryland announced the sale today at a campus celebration honoring the team’s achievement. Under the agreement of sale, Pepco covered WaterShed’s outstanding project costs and will pay for its transport and reassembly. The sale price was not disclosed. The agreement also draws on the Watershed team’s expertise to facilitate its transport and siting. Student team members will serve as docents once the facility opens, explaining the house’s capabilities and design features. The Maryland team designed WaterShed to help reduce storm water runoff. The house harmonizes modern, traditional, and simple building strategies, balancing time-tested best practices and advanced technological solutions to achieve high efficiency performance in an affordable manner, the team explains. Its winning design includes several technical innovations, including a patent-pending indoor waterfall that provides humidity control in an aesthetically pleasing manner. “We inspired ourselves and thousands of others through the Solar Decathlon, but an organization such as Pepco has the resources and power to reach millions,” says Leah Davies, WaterShed student team leader. “With Pepco, WaterShed will serve as an educational backbone for future innovations in residential energy use – just as we designed it!" 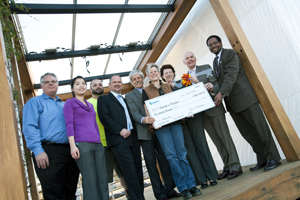 The 200-member UMD Solar Decathlon Team includes students and faculty from the Maryland School of Architecture, Planning and Preservation, the A. James Clark School of Engineering, the College of Agriculture and Natural Resources, the College of Computer, Mathematical, and Natural Sciences, and the University Libraries. Maryland businesses and professional groups provided significant financial and mentoring support as well. Pepco, a subsidiary of Pepco Holdings, Inc. (NYSE: POM), delivers safe, reliable and affordable electric service to more than 789,000 customers in Maryland and the District of Columbia.